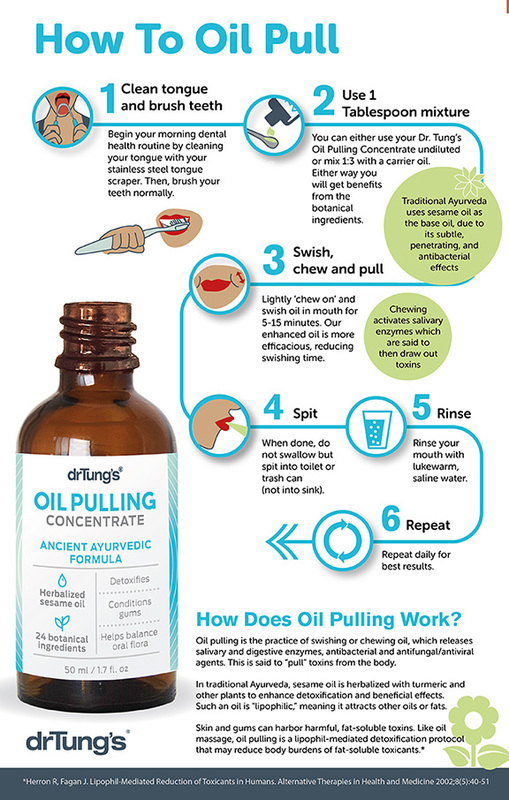 This is our suggested oil pulling routine. 1 Clean tongue and brush teeth Begin your morning dental health routine by cleaning your tongue with your stainless steel tongue scraper. Then, brush your teeth normally. 2 Use 1 Tablespoon of mixture You can either use your Dr. Tung’s Oil Pulling Concentrate undiluted or mix 1:3 with a carrier oil. Either way you will get benefits from the botanical ingredients. 4 Spit When done, do not swallow but spit into toilet or trash can (not into sink). 5 Rinse Rinse your mouth with lukewarm, saline water. 6 Repeat Repeat daily for best results. People have their own preferences and you can mix DrTung’s Oil Pulling Concentrate with organic sesame, sunflower or coconut oil. You may need to gently warm the coconut oil if it is below 76ºF to make it easier to mix. We suggest mixing the whole bottle of concentrate into the carrier oil so it is pre-mixed for your next oil pulling session. Oil pulling done with plain oils such as coconut, sunflower or sesame does not provide as much benefit compared with using DrTung’s Oil Pulling Concentrate. Plain oils provide a detoxifying affect from chewing and swooshing, whereas our concentrate is like a 3-lane highway with 3 major benefits. 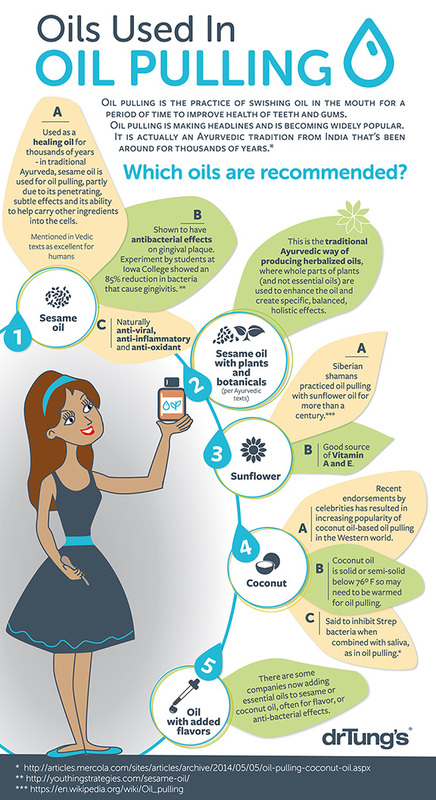 If you are oil pulling, why not get 3 complete wellness benefits instead of just one? Lane 1 Antibacterial Effect–DrTung's Oil Pulling Concentrate (with 24 Botanicals) has an antibacterial effect on the mouth and gums. Lane 2 Nourishing Effect–Organic Black Sesame Oil is very highly regarded as a penetrating “carrier." It transports the health benefits of the Ayurvedic herbs into the gums and through the mucous membranes, thus carrying those benefits into the body. Lane 3 Detoxifying Effect–Chewing and swooshing our “super charged” Oil Pulling Concentrate for 5-15 minutes removes toxins.